Home recipes and natural beauty tips for glowing skin will always be in fashion since the only thing you need is a little time and a few easily found in anyone’s kitchen natural foods. So, let’s see now some easy and effective home treatments for a radiant skin. 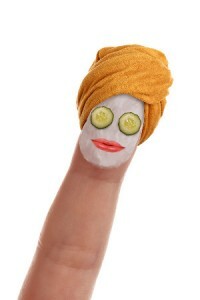 You will find them quite enjoyable to prepare and relaxing while you are waiting for them to work on your skin. Just a reminder: Organic foods are always safer and more beneficial to use in those recipes because of the lack of chemicals that could aggravate and harm skin. Are you sitting and feeling that you need something light and healthy to eat but you are also wondering how you can get a glowing skin for later that you’ll go out? Don’t think it twice! Just give yourself a healthy and delicious solution by grating half an apple, adding one teaspoon of yoghurt, another one of honey, and you will have both a skin glowing mask and an excellent snack. Another mask that can give you a healthy glow is made by mixing a mashed banana, 2 teaspoons of yoghurt and 1 teaspoon of honey. Make a thick paste and leave it on your skin until it absorbs completely. Bananas contain elements that clean the dead cells of the skin and make it look glowing. Mashing avocado and adding one teaspoon of honey can give you a super hydrating mask. This can make your skin look smooth and radiant. For extra glow you can boil two tablespoons of rice in ¼ ltr. of water. Let it cool and apply on your skin. For oily skin make a mask with 1/2 cup of mashed cucumber with its skin (best is to go for an organic one), a spoon of milk cream, one spoon of rose water and another one of oatmeal. Mix the ingredients until you have a paste and apply on a clean face for 20 minutes. Remove with lukewarm water and apply a rich moisturizer after that. The cucumber has styptic qualities, the rose water softens and moisturizes the skin and the oats flour removes the dead cells. With all their beneficial nutrients such as vitamin A and others, carrots can keep your skin hydrated, reduce blemishes, prevent acne and cure many skin ailments. Just boil 2 small carrots, make a paste and leave it for 15 minutes on your skin after it gets cool. That way, you will have a revitalizing mask for glowing skin. 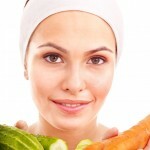 Drinking carrot juice can also be good for your complexion or even having them raw. Have you ever done a turmeric facial mask? Turmeric is well known for its anti septic and anti bacterial properties. By mixing a quarter teaspoon of turmeric powder, a teaspoon of gram flour and a little honey and milk until it forms into a paste, you will have a mask that can cleanse your skin and reveal its natural glow. Rinse the mask off after you leave it on the skin for 30 minutes. Speaking of honey, did you know that honey can be used on its own as a mask? For better spreading, keep your skin a bit moist before applying. Honey is full of beneficial antioxidants that can help in cleansing your skin, leaving it supple and glowing. If you have an oily skin you can first remove the extra oiliness by rubbing the white of an egg on your forehead, nose or chin. You can leave it there for ten minutes, rinse it off and you will feel your skin more firm. Then, you can apply whichever glowing mask is quicker for you to make. Sounds yummy but mashing few strawberries to make a puree and mixing it with a bit of honey can provide you with a quick anti septic solution. Apply on your skin, leave it there for 15 minutes and then rinse it off with lukewarm water. So, what do you think? Isn’t making home face masks fun? I would add that it’s also very beneficial for your skin since you know exactly what kind of ingredients you are using and it’s a cheap solution, too. But even more than that, it gives you the pleasure of creating your own home skin recipes. Just a warning: When you experiment these homemade natural beauty tips and recipes for glowing skin, it is always better to apply a little of the mixture on another small area of your skin in case u are allergic to a specific component. For example, citrus fruits, because of their acids, can prove to be irritating for some types of skin, causing redness while some people are allergic to honey.